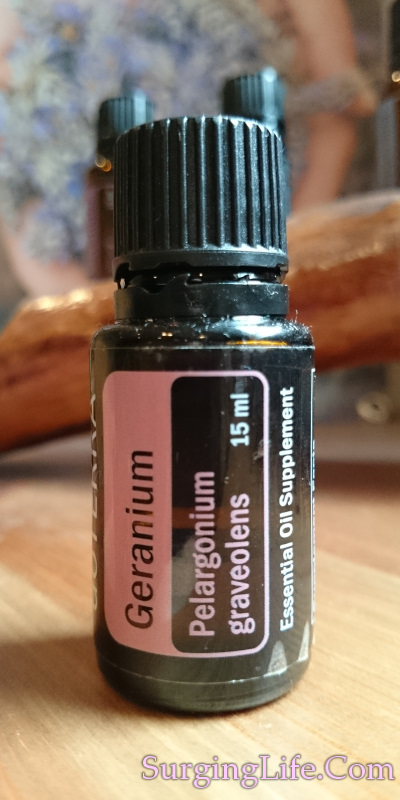 Geranium Essential Oil actually come from the Pelargonium genus of plants which are commonly called Geranium, yet the term Geranium actually belongs to a separate genus of plant. There are around 200 species of Pelargonium, and the oil yielded is often used as an anti-depressant, anti-septic, astringent and hemostatic. It is also used in combination with Rose Essential Oil due to its lower cost yet similar nature. You can discover more on Geranium Essential Oil Uses below and how using this oil can be highly beneficial. The Pelargonium species of plants are evergreen perennials which are indigenous to Southern Africa, which have become popular garden plants in temperate areas. Due to the wide variety of species there is a large variety of characteristics, with variety coming in flower colour as well as plant aroma to mention just a couple of things. The main species used for essential oil production though are Pelargonium Graveolens, Pelargonium Capitatum and Pelargonium Radens. The essential oil is gained via steam distillation from the leaves of the plant. It varies from colourless to slightly green and is clear in nature, with a thin or watery viscosity. The aroma has a middle note with a rose like scent, this is even more accentuated with Rose Geranium. The principle constituents that yield the properties of this oil are geraniol and citronellol, though a-pinene, linalol, limonene, phellandrene, terpineol, and various alcohols are present also. As an emmenagogue it should be avoided during pregnancy. Otherwise it is generally considered a safe and gentle oil to use. Good quality Geranium Essential Oil comes at a price. For this reason some suppliers synthesise it using artificial esters and other oils, as such voiding the results obtainable in therapeutic use. If you wish to achive the true effects of this oil through aromatherapy or massage then source your oil very carefully. Clinical evaluation of the essential oil of Pelargonium graveolens for the treatment of denture stomatitis. "Natural products are proved to play a good role as an alternative to synthetic chemicals in clinical conditions. Previous studies showed that Pelargonium graveolens has anti-inflammatory and antifungal activity against Candida albicans. The aim of this study was to evaluate the efficacy of essential oil of Pelargonium graveolens in the treatment of denture stomatitis... According to mycological data and clinical observation after treatment in the case group, 34% of patients had been improved completely, 56% partially and 10% had no improvement. In the control group, 5% of patients had complete recovery, 25% partial recovery, and 70% no improvement. A significant reduction in fungal growth was observed in case group rather than the control group." Sabzghabaee AM, Shirdare Z, Ebadian B, Aslani A, Ghannadi A.
Dent Res J (Isfahan). 2011 Dec;8(Suppl 1):S105-8. Geranium Essential Oil uses range over a very wide variety of conditions. From acne and other skin related conditions, through viral infections, to hormone imbalances and more. It also has a pleasant effect on the mind, helping to ease away stress and elevate the mood. In terms of skin care it helps with a diverse set of issues, from acne and oily skin to conditions such as psoriasis and eczema, one thing that links many of these conditions is stress, though they all act in different ways and usually have differing types of treatment. Something else worth noting is that Geranium essential oil also helps to revitalise skin cells, freshening and rejuvenating your skin. The regenerative effect of Geranium essential oil comes through well with all uses. Whatever you are doing this oils ability to help regenerate tissue and cells is incredibly beneficial. All types of dis-ease have an effect on cell and tissue condition within the body. By using an oil such as this to counter that, and promote healthier condition as a result, is incredibly useful. Whilst the main way this action is used by many is in terms of skin care, it has benefits across other conditions too. Skin care is much heralded in terms of the uses of Geranium oil, though its action on the hormonal balance of the body is well worth noting too. Applied topically or used within an aroma diffuser this oil can get into the blood stream and help to bring the natural balance back to your hormone levels. Through life various things happen which can affect the balance of hormones in your body, stress being far from the least of these. When your hormones are out of balance your body and its state of health goes out of balance too. Sleep patterns can become strange and there are other unpleasant effects too. Getting your body chemistry back in the right balance can help you in numerous ways, and you will in general feel healthier as a result. Geranium is helpful for treating insomnia for this and other reasons, including its ability to calm and relax, which on to of its balancing nature really helps with dealing with insomnia. As an emmenagogue it should be avoided during pregnancy. That said it is generally considered a gentle and safe oil to use. Its effect on skin conditions from acne to dermatitis to eczema lead it to be beneficial for many people, and Geranium is used in many skin care products that focus on promoting young healthy looking skin due to its revitalising effect too. It helps to balance hormones and thus bodily and mental health too. Whilst it also has a calming effect which helps to ease away stress. Plus it can be used to treat numerous fungal issues, sore throats, digestion and diabetes and many other things too. For the best results in terms of Geranium essential oil uses use a good quality source. The purity makes a big difference, and having a totally natural oil means you will access the therapeutic qualities effectively. You can find a high quality source of Geranium essential oil here, and there is more on essential oils here.